"Education is absolutely critical to breeding successful environments, economic development and moving the society forward," says El Paso businessman Paul Foster. "Living along the border, I see a lot of evidence of where the lack of education creates all kinds of issues -- not just poverty, but other issues like crime, low-wage jobs, and areas of stalled economic development. I believe that the key to improving these areas is to start from grade school to educate children. It's just something that I've developed a passion for and that I believe is critically important." 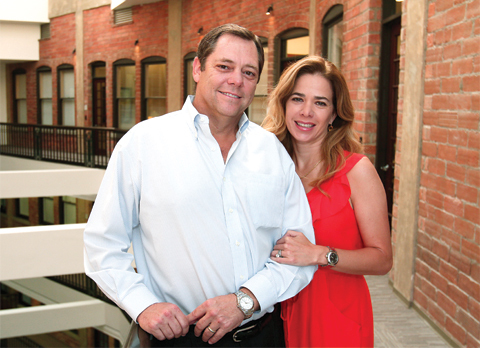 Foster and his wife, Alejandra de la Vega Foster, have dedicated themselves to empowering others through education. Mr. Foster, a successful entrepreneur and self-made businessman, holds a firm belief that our future depends on the education of our youth, and that the competitiveness of our nation is dependent on our ability to educate our youth at levels comparable to our competitors around the globe. "I think coming out of Baylor I had a foundation that not only was conservative but valued a very high degree of ethics, which is something I learned a lot about at Baylor and that I've tried to apply in my life," he says. "The other thing is service, not only in my fraternity but also in Student Foundation and other groups where I learned the importance of giving back to the community, and that's stuck with me for a long time." Foster's business degree from Baylor launched him into a series of jobs in the oil refining industry, eventually leading to his current position as executive chairman of Western Refining, a Fortune 500 company with nearly 4,000 employees and the fourth largest publicly traded independent oil refinery in the U.S.
"Western Refining is a company that I was able to start without having much in the way of resources, and I'm just proud of the fact that we've been able to put the company together and to achieve some success," says Foster. "It's something that's been very rewarding to me and has enabled me to give back to places like Baylor. Without that as my base, I wouldn't have been able to do a lot of the things that I've been able to do." Raised in Lovington, N.M., Foster's deep Baptist roots and desire to pursue a premed track led him to Baylor. While there, Foster was a member of Sigma Alpha Epsilon fraternity and Student Foundation. Some of his fondest memories include attending basketball games at the Heart of Texas Coliseum and participating in Sing with his group of friends. Foster says business professor (now dean) Terry Maness had a big influence on him. "Dr. Maness was also the faculty sponsor for our fraternity, and so I got to know him really well and have stayed in touch with him all these years -- he's one of those ageless guys." Recognizing that he would have found such an asset valuable during his time as a Baylor student, Foster funded the development of the Paul L. Foster Success Center in the renovated Sid Richardson Building. Dedicated in 2007, the facility is devoted to positioning students for success in their academic and professional lives. In a single location, it houses five departments essential to student success: Academic Advisement, Academic Support Programs, Access and Learning Accommodation, Career Counseling, and Career Services. "I'm enormously satisfied and proud that I was able to participate in it. I wanted to make a meaningful contribution, and the Success Center was just a great fit. I look back at my time at Baylor and I think, honestly, that I could have benefited a great deal from something like it. I was a kid from a small town, I didn't know anybody, and didn't really have a lot of resources in terms of knowing where to go or who to turn to when I needed something. I just felt that it was something that would have added a lot to college life." Beyond Baylor, the Fosters are very active in education initiatives both locally and statewide. Foster currently serves as vice chairman of The University of Texas System Board of Regents and formerly was on the Higher Education Coordinating Board. He donated $50 million to establish the Paul L. Foster School of Medicine at the Texas Tech University Health Sciences Center in El Paso in 2007, and he has donated millions more to the University of Texas at El Paso. In 2009, Foster was honored with the Distinguished Alumni Award by the Baylor Alumni Association. His past honors include being named "Who's Who in America," "Best Philanthropist" by El Paso Magazine and "Entrepreneur of the Year" by the Greater El Paso Chamber of Commerce. De la Vega Foster, who is from a prominent family in Mexico known for giving back to the community, studied engineering and played basketball at Tecnologico de Monterrey. A leading businesswoman and philanthropist in the region, she now serves as president of Almacenes Distribuidores de la Frontera, a convenience store chain with more than 190 stores in Juarez, Mexico. Mrs. Foster formerly was vice president and CEO for the Club de Fútbol Cobras de Ciudad Juárez, a professional soccer club. A believer that sports can help unite communities, De La Vega Foster (and her husband) are part of the MountainStar Sports Group that is working to bring a new baseball stadium and the San Diego Padres' AAA team, the Tucson Padres, to El Paso. Passionate about helping the Ciudad Juárez/El Paso border communities, Mrs. Foster has served on several boards, including time as a director of the Texas Tech Foundation, co-chair of the Paso Del Norte Water Task Force and president of the Juárez Chamber of Commerce. She has been heavily involved in the construction of a new museum for the children of Juarez.